[19:01] <+TrueInOne_Preston> I’m Preston Poland from True In One, and my new game is Horrors: The Scary Story RPG. [19:04] <+TrueInOne_Preston> (Link: https://www.kickstarter.com/projects/1842635065/951809305?token=53f3c6cf)https://www.kickstarter.com/projects/1842635065/951809305?token=53f3c6cf here is the kickstarter preview, the campaign itself will launch october 1st! [19:03] <+KenSpencer> I am the line developer and lead writer for Rocket Age from Cubicle 7 Entertainment, and I am here to talk about our newest supplement, Lure of Venus, a compendium of all things Venus, Venusian, and Venus-like. [19:01] <+hawke_robinson> I have been studying the effects of all forms of role-playing games: tabletop, live-action, and computer-based. [19:02] <+hawke_robinson> Over the years it has become clear that role-playing games can be used as an intervention modality to achieve various educational and therapeutic goals for various populations. [20:01] <+J_Thompson> Hello everyone. I am Jonathan M. Thompson. I am the President/CEO, Chief Writer and Chief Cat Herder at Battlefield Press, Inc. Today we are here to talk about our newest project, Northern Crown: New World Adventures for the Pathfinder RPG, and is used under license from Atlas Games. [19:03] <+James-Vexith> Greetings! 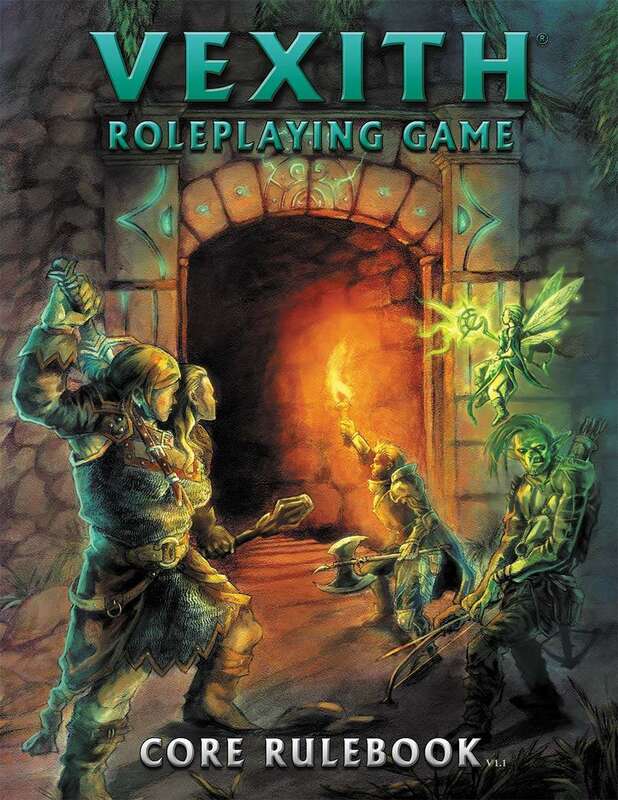 My name is James Fields and I’m the designer of the Vexith RPG, a newly-released medieval high fantasy roleplaying system. Not being fully content with the rules and mechanics of other commercial tabletop roleplaying games, we set out to devise our own system. We avoided classes, experience levels, and ever-increasing health points totals. We also implemented customization into many aspects of the game so that each and every character could be truly unique. [19:04] <+James-Vexith> To give a brief intro, some of the game’s main features include a huge array of playable species (44 in total), exciting and brutal combat that is not just an exercise in hit point reduction, flexible point-buy characters with many choices, and the ability to customize almost every aspect of your character (weapons, spells, species traits, etc.). [19:03] <+Thorin_Tabor> Hello. I am currently running a kickstarter for a new science fiction horror RPG called Shadows Over Sol. [19:04] <+Thorin_Tabor> It’s set in our own solar system, some 200 years in the future. It’s fairly hard sci-fi, with inspirations including James S. A. Corey’s The Expanse novel series, Alien(s) (the first two movies in that franchise in particular) and The Thing. [20:03] <+Mike_Myler> Last year I ran a Kickstarter for my house campaign setting (Veranthea Codex) and that goes on sale later this month, but right NOW I’m running a Kickstarter for a new project: Hypercorps 2099! [20:04] <+Mike_Myler> *Hypercorps 2099* is a rule system you lay over your existing game (Pathfinder or D&D 5th Edition) to make it into not just fantasy, but cyberpunk superhero fantasy.